To a large extent, it depends on the time of year. One of my courses is a month-long intensive course. I only offer it 3 times per year but during those months I’m working day and night. Most of the time my life looks like this: I love getting to work first thing in the morning. With a cup of coffee close by, it’s the best time of day for me to get all my creative and hard work done. That might be course design, writing, outreach and/or marketing. Around mid-morning, I walk away from the computer and give myself some time to shut off. I’ll run, meet a friend for coffee, just listen to some music while taking a walk, or get into a book that is totally unrelated to work. After lunch, it's a combination of teaching, social media engagement, communicating with my team, responding to email, finishing up tasks or projects, recording YouTube lessons, editing videos, etc. Whatever’s on my checklist. While I try not to, I do check in most evenings for one final look at emails and social media as I don’t like to leave anything unanswered for too long. Self-care is so important for teachers. What do you do in your spare time to relax? Cooking, reading, and exercising are the best ways for me to relax on a normal day. However, I also try to plan longer vacation times into my year so I can get a full week or two to shut off. Life’s circumstances gave me the push to start my own business. I was preparing to move overseas due to my husband’s profession and with the visas we had, I wasn’t able to work in-country. I love having a career, so the best solution I could come up with was to start my own business based in the U.S. before moving and I felt that my professional experience gave me a pretty good idea of what I was getting myself into. I knew nothing would happen fast or overnight. I took about a year or so to get a firm grip on what I was doing online, who I wanted to work with, and what I wanted to offer. I’m very much the slow and steady type, thinking a few years ahead. To some, that may seem like a very long time to get started but I’m grateful I took a slow approach and had realistic expectations. I’ve not lost time or money on creating courses/services that don’t work and I’ve built a loyal, engaged community that I love spending time with. In fact, whenever I travel I try to meet with students and other women in my community; those experiences have been major highlights in my life over the last few years. Where can students purchase your courses? Right now I offer two courses for shy English speakers with an intermediate level or higher in English: Fluency School and Confident Job Interviews. 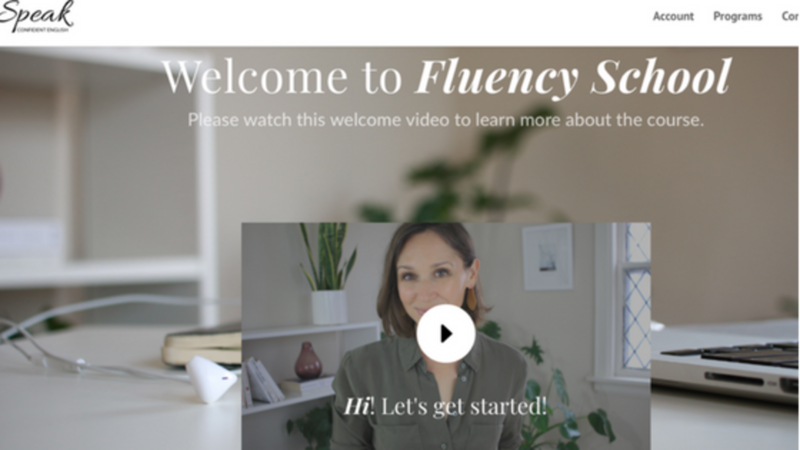 Fluency School is a one-month intensive speaking course designed specifically to help overcome fear, build confidence and improve fluency. Both courses are available on my website Speak Confident English. In March 2018, I co-presented at the TESOL Convention in Chicago on Starting and Sustaining an Online Teaching Business. My co-presenter and I were thrilled with the standing-room-only crowd. 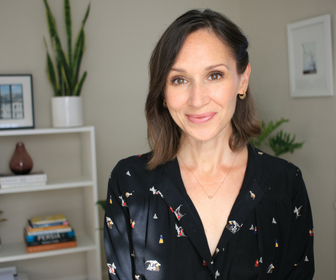 During and after the convention, I had several requests for coaching and/or advice on how to start an online teaching business or what to do if things aren’t going as expected. To answer some of the questions I’ve received and reach a broad audience, I launched my site Transition to Teaching Online with a Tools of the Trade page where I share the ins and outs of what I’ve learned about running an online teaching business and all the various resources I’ve tried, tested, and used over the last several years. The focus of the site is teachers considering a move online but who aren’t sure how to get started and for those struggling to gain momentum in their online business. How do you promote or market your courses and website? Word-of-mouth has been most important for course promotion. I’m fortunate that my students are excited to share information about my courses with others. I regularly get students who heard about Speak Confident English from a friend, colleague, or family member. When visitors come to my site, I offer a free training that offers a glimpse of who I am and how confidence and fluency are possible, even for the shyest English speakers. I send weekly emails with free lessons, tips, and advice and these emails often include information about my courses. Finally, I occasionally do Facebook Ads, particularly for my Fluency School course. I only offer this course 3 times per year so I do a bit of advertising before each registration period. Do you do everything yourself or do you hire people with specific skills to help you? Like most teacherpreneurs, I started out doing everything myself including social media outreach, marketing, website design, blog writing, video editing, graphic design, accounting, etc. That was in addition to my lesson planning, course creation, and teaching. Now I’m fortunate to have a small team. I have two employees who work with me on my day-to-day operations and provide support in my courses. Additionally, I’ve invested in a great accountant and in business coaching to help sharpen my skills and growth. I’m quite active on Facebook and I post videos regularly to my YouTube Channel. For LinkedIn, I have my personal page and I have a page for Speak Confident English as well. What skills did you gain from classroom teaching that have allowed you to excel as a teacherpreneur? In the classroom, teachers constantly adapt. We can plan a perfect lesson that falls flat so we pivot; technology fails so we come up with an alternative plan; course books don’t provide everything our students need so we supplement… the classroom taught me to be innovative, to respond quickly to changing needs and situations. These have certainly been necessary in launching and sustaining an online teaching business. What have you had to do outside of your comfort zone as a teacherpreneur? To some degree, every aspect of running an online business has felt that way at one point or another. Course creation, lesson planning, and teaching come easily… but finding students, communicating to my audience, utilizing social media, doing videos and, more than anything, putting myself out there so publicly has definitely been a challenge. But I’ve learned I can do it if I put the effort in. I talk to many teachers about their fear or doubt in trying something new or "putting themselves out there". What advice would you give to these teachers? For the last several days, that has been front and center in my mind and I can list dozens of times I’ve felt that something just wasn’t possible. Either because someone else had already done it, someone did it better, because I didn’t feel qualified, had too much self-doubt, etc. The truth is, if you stay true to who you are and what you want to do, if you put your head down and do the work, you’ll be able to accomplish far more than you thought was possible. That doesn’t mean it won’t be scary or that you won’t need to adapt your original plans, but you can totally do it. Only thank you. Thanks for this opportunity to share and thank you for creating this space for teacherpreneurs to share their experiences. Thank you Anne Marie for sharing information about your transition to online teaching and the success of your company. I hope to meet you in person at TESOL 2019 in Atlanta!